If the boys were honest CCBB had come much further in the rally than any of them had really believed Vera was capable of since setting off from Milton Keynes 36 days ago. Despite this they were in no mind of mood to give up having got this far, especially as they were now only a matter of days from the finishing line! If they were to reach that much sought after chequered flag though they would have to sort out one small problem, a very broken car. First things first though, hydration. After a few too many games of Gin Face the night before the boys went to the shop just up the road and got a load of ice-cold water to sooth their head aches! Vera and The Mini in their stricken state. When the boys got back to camp they spoke to Joe, the translator, about getting the car fixed by the mechanic staying with the family and also where they could possibly get car spares. He suggested that they tried the “Technik Market” near the city centre. Matt and Dunc went off to try and find the market with Jennifer and Henry stayed to try and instruct the mechanic. The big story of the morning, though, was that John from The Baked Potatoes had decided to up and leave with another team, there never really was an explanation, he just left Jennifer in the desert with a broken car, what a gent! On the way to find the market Dunc, Matt and Jennifer managed to get some cash out of an ATM; this was after trying three other cash points and looking on with bewilderment when locals managed to withdraw cash immediately after being denied themselves. They then went to the supermarket and got some supplies for the road ahead, whether that was going to be in Vera or on one of the rickety buses that operated across the country was still to be seen. Setting up camp next to the roadworks. Jennifer opted not to come to find the Technik Market and instead waited near the supermarket for the boys to return. After a good while searching and asking for directions Dunc and Matt finally found the market, here there must have been spares for every automotive mechanical component you could think of, but unfortunately very few electrical ones! They did find a relay that had the same pattern prongs as Vera’s faulty engine management one and decided to take a 6,000 Mongolian Tugrik gamble on it! But amazingly when they got back to the yerts the mechanic indicated that he had fixed Vera and Henry seemed to agree. The mechanic had managed to bypass the circuit with the faulty relay on, this meant that the battery would be charged constantly which was good but had meant that the cooling system (fan thermostat etc.) had also been disabled. Luckily Dunc and Matt had bought a switch at the Technik Market in case this happened, therefore the boys soon had the switch wired up so that the fan could be operated by the driver. Just as they thought everything was working fine Matt tried the electric windows, which handily got stuck half way down. 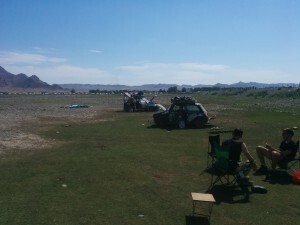 The boys took a joint decision to get the mechanic to just put the windows up and get on with it without fixing them; the heat was probably going to be unbearable in the desert but the car was working and that’s all that mattered! Whilst this was all going on Jennifer had managed to fix the mini and despite being told she shouldn’t carry on by Joe she decided she would, how rally! The Mini really was in a bad way (the engine was practically falling out of the bottom) but the boys were never going to deny someone else a chance of Rally glory and agreed that the Mini should be given a chance, the CCBB boys would share time in the Mini to give Jennifer company. Unfortunately after waiting for a couple of days for CCBB and The Baked Potatoes, The Bourne Dubbers were too far behind their schedule to wait any longer and left during the afternoon, the boys hoped to meet up with them at the finish line. Around 2 hours later the remains of Rolling Thunder made their way out of Khovd, sneakily driving round the back of the police hut so they didn’t have to pay the toll! The next 25 miles of gloriously flat, Chinese laid, tarmac passed quickly and then the gravel hit once again with the rumble strips that so often accompanied it and the convoy slowed to a crawl. They were now travelling through active roadworks and came face-to-face with a few mighty road rollers during the next couple of hours. 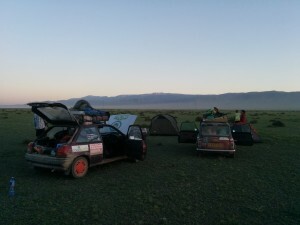 All three cars in the convoy were working well (not that this was surprising for the Micra) and progress was being made over the rough ground for the first time in days. 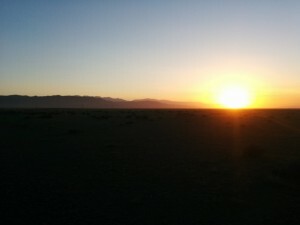 As the sun started to set Rolling Thunder found a nice place to camp near the road and chef Duncan prepared a meal in the wonderful sunset before they all went to sleep, with the CCBB boys a little anxious about what would lie ahead the next day.